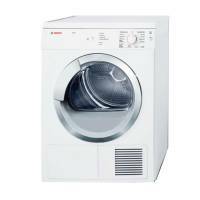 The best clothes dryer I have owned is my current Bosch Axxis dryer. We purchased it because it is extremely energy efficient. It has a much better Energy Star rating than most mainstream brands. This model features a "butterfly" drying pattern, meaning that it spins first in one direction, then in the other. This action is supposed to be easier on fabrics and help clothing to last longer. This dryer features several different options for drying clothing. I most frequently use the sensor dry so that I can set it and forget it. There are seven different levels of dryness available for selection. The user simply selects the level that most closely matches the wetness level of the current load. The dryer will keep drying until the clothes are dry. Also available are air fluff, timed dry, and delicate dry options. Another nice feature of this dryer (and Bosch's compatible washing machines, which I will review in another post) is that they are very compact, sleek, and attractive. In fact, the washer and dryer come with a stacking kit, so if you are really pressed for space you can set them up one on top of the other. Even side y side they are much more slim than most brands on the market and are ideal for a small home. This being said, do not worry about the amount of clothes this dryer can handle. While it is small on the outside, the inner drum can take a rather large load and dry in efficiently. All in all I have been very happy with this brand and this dryer in particular. It is slightly more expensive than others, but, you do get what you pay for.